[1000 words]The City of Dawn was abuzz with the shouts of its citizens as their most celebrated warriors returned from a weeks-long mission into the Sands of Time. Bandits quaked at the sounds of the Denizens of Dawn as they moved across the endless sands of their kingdom, dispatching any who dared fly the bandit banner. The mere mention of their movement spurred bandit tribes to vacate their territory. None dared attempt to challenge the Denizens of Dawn, or lay siege to their glorious city. Nestled against a giant cliff, a protected waterfall thundered almost as loud as the well-wishers welcoming their gallant heroes. The waterfall provided not only drinking water, but also a method of communication from the lookout posts atop the massive granite wall. Message vessels quickly thundered over the falls to rest in a receiving pool policed every hour of every day. Many had attempted to find the source of the water, but none who started the journey had ever returned. Some speculated that once they had reached the source, they stayed to reap the vast riches of gold that washed down stream. Gods and goddesses of wealth and privilege lived there, and the trivial riches that flowed were of no concern to beings that held life and death in their hands. For centuries, the denizens of Dawn needed only to gather the metal from the water. The river that meandered through the City of Dawn boasted many forges and water wheels. Freed from manual labor, the City of Dawn spent most of their time in leisure. Other towns and villages had to fight for survival, but the Denizens of Dawn fought for sport. Their metal weapons, armor, and other wares were highly sought after, for not only did the Denizens of Dawn dedicate heir time to the art of warfare, they boasted the finest armor and weapons the world over. It was rumored that the city surrounding the waterfall and river was merely home to the craftsmen and artisans who worked from sun up until sundown creating merely for the sake of improving each other’s designs. The best design was an achievement short lived, as competition was fierce. The Denizens of Dawn, when not campaigning, lived in the rock under the falls. No one had ever seen the alleged city under the rock, but no one had denied it either. When the sun fell behind the granite wall, it cast long shadows across the city, hence the name. In addition to this, precipitation frequently passed over the city, leading to fires and forges that had burned for generations. The Denizens of Dawn rode through the streets on their mounts of exotic horses, captured during campaigns across the sea. They looked more like prevailing gods than warriors. The golden armor they wore gleamed, for as much as they prided themselves in the sturdiness of their armor, they were fastidious in maintaining it. The brilliant capes, dyed from the leaf of the indigo plant rivaled the clear sky in its shade of blue. But, as the sky featured puffy white blemishes, the Denizens of Dawn allowed no such blemishes on their weapons and armor, allotting time each cycle to clean and polish their ensconcements of gold. It was no wonder they seemed god-like in their presence. The Denizens of Dawn believed their land divine and the royal family demigods. The walls of Dawn had withstood sieges lasting many cycles of the moon, and stood centuries. Jahan watched, with a twinge of envy, as her brother Ejaz, the Marquis of Dawn, dismounted from his horse and embraced his betrothed, Zoraya. Many considered Zoraya to be the perfect woman, and her upcoming marriage to Ejaz would be a celebration of epic proportions. It wasn’t just beauty that Zoraya possessed, but she was known as one of the kindest girls within the Gates of Dawn. Her waist-length brown hair was the envy of many a maiden, and her dazzling blue eyes rivaled the indigo-dyed cloth. Whispers told that her parents would have named her for the color if the Gods hadn’t forbade it. The taboo notwithstanding, the moniker stuck, and Zoraya lived with it despite the gods. These coveted features were only glimpses of Zoraya’s true beauty. She selflessly helped anyone who needed it. Many girls who possessed only a fraction of Zoraya’s beauty traded it as if it were a currency, and not some random blessing from the Gods. No one was surprised when it was announced that she would wed the leader of the Denizens of Dawn. The Marquis of Dawn and “Indigo” Zoraya exemplified the City of Dawn – strength, beauty and kindness. Jahan sighed and turned away from the spectacle that was her older brother. Her gaze shifted toward the Falls of Dawn. Everything about the people and the city she loved exemplified their proud history: You could hear the capital letters as people spoke the names. It wasn’t a jealousy she harbored, that would’ve been uncouth, but a longing for her life to mean something more than being the little sister of the great Ejaz. The unending falls reminded Jahan of the nature of life – it kept going no matter what happened to you or around you. The falls stopped for no man or monarch. Some speculated that a fallen god had placed it there, and there was no source that any mere mortal could comprehend. Others felt it was had simply been carved that way by nature. No matter which way it was created, it was the symbol of the City of Dawn, and its ceaseless thundering shower filled Jahan with hope when she feared failure. Her perceived failures mostly amounted to her inability or non-desire to be like her older brother. Warrior women were a rarity, but it wasn’t forbidden. After all, the Denizens of Dawn were an enlightened people. Jahan smiled, regarding the swift deluge and moved forward in life despite all obstacles, just like the Falls of Dawn. 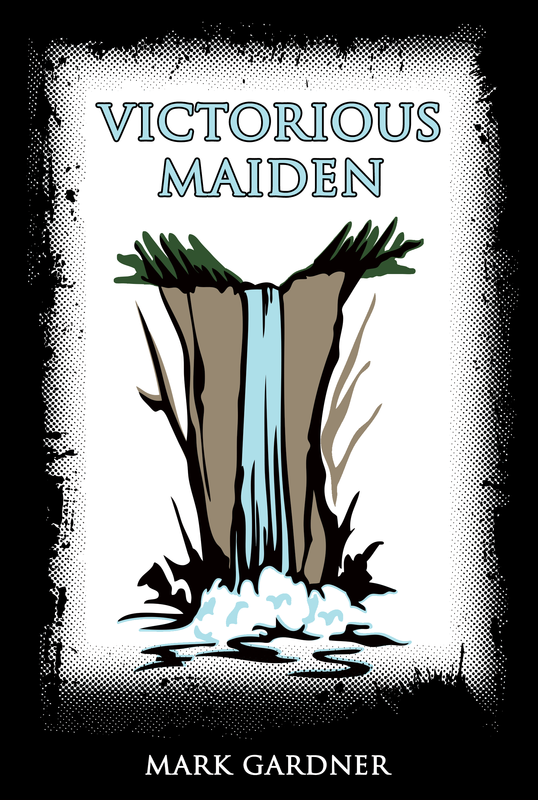 This entry was posted on Saturday, July 25th, 2015 at 11:00	and tagged with Victorious Maiden and posted in fiction. You can follow any responses to this entry through the RSS 2.0 feed.